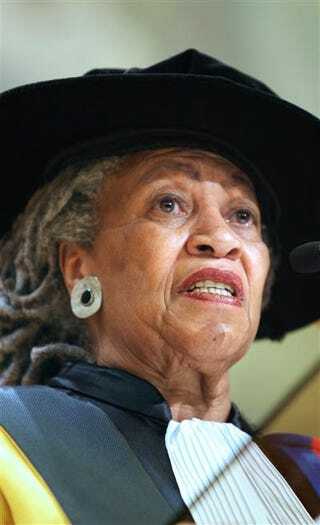 As she observes the racial dynamics at play in the Democratic presidential contest, Toni Morrison must be somewhere biting her nails. The Pulitzer Prize-winning writer never struck me as the nervous type, but if ever there was a case for the jitters, it is now. In recent months, Morrison has had to stand back and watch — maybe in horror — as an airy observation she made about Bill Clinton a decade ago continues to nip at Sen. Barack Obama's chances of becoming this country's first African American president. "African-American men seemed to understand it right away. Years ago, in the middle of the Whitewater investigation, one heard the first murmurs: this is our first black president. Blacker than any black person who could ever be elected in our children's lifetime. After all, Clinton displayed almost every trope of blackness: single parent household, born poor, working-class, saxophone playing, McDonald's-and-junk-food loving boy from Arkansas ." Her statement seems to suggest that because of the seemingly intractable endurance of American racism, Morrison was convinced that neither she nor "our children" would see the day when an actual black person would occupy The Big House. She seemed to be saying that Clinton was the best we could reasonably expect to see in a couple of lifetimes. That explanation appears plausible — until one considers Morrison's response sometime later, when television host Tavis Smiley asked her if she felt still felt that Clinton was black. "Yeah, I do," said Morrison. "I mean, culturally speaking, he certainly is." That no one seriously challenged Morrison's assertion says more about our society than it does about her. We have become so celebrity-obsessed that we often fail to critically examine the ideas of authoritative voices. In this case, the ideas proceeded from the mouth and pen of the deeply revered Morrison. I mean, this is the author of "Beloved," as brilliant a work of literature as has ever been produced. How, one might wonder, can genius give voice to such a ridiculous remark? In truth, smart people do it all the time. Witness Andrew Young, who makes foolish statements regularly these days. Like anyone else, Toni is at least entitled to an occasional gaffe. But instead of contesting Morrison's view, many African Americans tried to up her one; some folks even cited Clinton's sexual dalliances as further proof that he's a real brother. What's most disturbing is that many blacks don't seem to notice or care. In Harlem, of all places, African Americans' televised fawning over the Clintons has at times looked like reruns from "Birth of a Nation," which portrayed "good" blacks as contented slaves. It's undeniable that during his two terms in office, Clinton demonstrated relative compassion for black concerns. But it is also a fact that he slyly shifted the Democratic Party further to the right. And he did it by shoplifting favorite Republican racial ploys, such as assuring disgruntled whites that he'd dismantle welfare, or using black churches as symbolic props for family values speechifying. Watching a recent Democratic debate, I wondered if Morrison cursed, as I did, when a moderator asked Obama if he thought that Bill Clinton was black. In 2004, we saw the ability of the spin machine to turn reality on its head. We saw John Kerry, a war hero, swift-boated, while bouncy George Bush, a combat-dodger if ever there was one, was hailed as a patriot. As reality shifts go, the 2008 campaign feels like déjà vu. Only this time, it's an African American repeatedly being asked to prove his blackness, while a white dude with a Harlem office is ascribed more soul than the late James Brown. If Toni Morrison was watching when the moderator posed that bogus question, she should have dropped to her knees and begged the ancestors' forgiveness for allowing herself to be an unwitting party to such a high-stakes charade. To me all this black-Bill buffoonery offers yet another vital lesson about the state of the race: African Americans have been so deeply wounded, and for so long, that when a silver-tongued white man shows up and treats them halfway decent, they lose perspective. If nothing else, Toni Morrison is a woman of conscience. So it came as no surprise recently when she publicly announced her support for Obama. Though she would likely never acknowledge as much, I suspect that in some small way Morrison is trying to counter the looniness that spiraled from an essay from which she is a decade removed. Of course, it's not Morrison's fault that countless African Americans simply took this black Bill thing too far. She is certainly not the reason that so many showered the crafty Clintons with unconditional support without subjecting them to more thorough review. Neither is Morrison to blame for the puzzling behavior of all those civil rights giants who fought and bled for our time to come, only to cut deals and place bets when the moment arrived. In my mind, Toni Morrison remains a national treasure whose integrity is unassailable. Still, there can be no denying that, willingly or not, she played a role in propagating the myth of Bill as black president. I, too, am biting my nails, Toni. And probably like you, I'm hoping the myth somehow fades before the final votes are cast. Nathan McCall is an author and regular contributor to The Root.